Take part in a Ghost Hunt and an optional Sleepover at 30 East Drive Pontefract, West Yorkshire a house very well known for its intense poltergeist activity and strange unexplainable occurrences. The poltergeist, later to become known as the Black Monk of Pontefract, began disturbing the Pritchard family in 1966 very soon after they first moved into the property..
Little did they know that this was to start the beginning of several years of an incredible, course of events that happened on a regular basis inside the house - all of which are said to have been witnessed by members of the family. The house soon became notorious for its ghostly accounts and a wide variety of paranormal activity was reported by many visiting research groups. Newspaper articles and books were also written about the phenomena and in 2012 the horror film “When The Lights Go Out” was released - the film was based on the events that were said to have been witnessed by the Pritchard’s at No. 30 East Drive on the Chesterfield Estate. The family reported much varied activity over the years - such as pools of water that would mysteriously just appear for no reason; lights were said to turn off then turn back on again and heavy furniture was reported to have been moved, thrown and overturned. Items and objects were said to have levitated and fly through the air; the list of events is endless - along with the presence of foul odours, vast temperature drops and heavy breathing noises. A figure was also reported to have been seen and is said to have been active throughout the house - often described as a black robed figure. 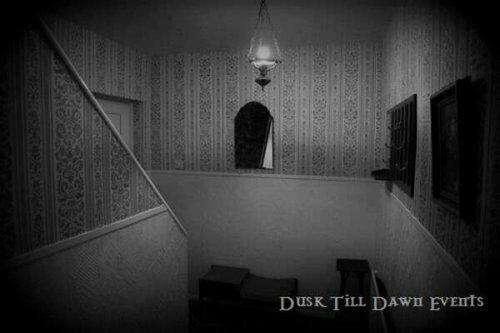 Dusk Till Dawn Events invites the bravest of you to join us for a night of investigation at this very eerie property; come with us as we enter this lost in time, ominous location said to be one of the UK’s most well documented haunted houses. Dusk Till Dawn Events have this unique building for an entire night’s investigation and you have the chance to join in your very own Ghost Hunt at one of the UK'S Most Haunted Locations. This really is ghost hunting at its best at such a fantastic haunted location but remember there may be no heating at this building. It may be very cold also very dark so wrap up warm and bring torches. What’s included in this Ghost Hunt. Ghost Hunt with Optional Sleepover – please bring your own sleeping bags/air beds etc if you are wanting to sleepover once ghost hunt has finished at 3:30am. Don’t forget to bring along your Camera’s, Camcorders and any other recording equipment you never know you may catch something on film. Please note:This event may or may not have a guest Medium attending. There will no history tours at the start of the night which will enable you to get straight into vigils and investigations at this very haunted location where YOU are the Ghost Hunter! If you choose the non-refundable deposit option, the final payment for this event will be required no later than the 6th August 2019. If you are sleeping please ensure you bring along your sleeping bag, bed roll, camp bed, air bed etc and pillow. If you are sleepingÂ please ensure you bring along your sleeping bag, bed roll, camp bed, air bed etc and pillow. We accept a non refundable deposit of £20.00 per person for our Ghost Hunting Events that are 5 or more weeks away. On booking this event/venue you agree to our Terms & Conditions. Please note: The ghost hunt will finish at 3:30am should you wish to extend your night after the ghost hunt by sleeping then please bring your sleeping bag, camp bed, blow up air bed and pillow along with you. This event may or may not include a guest Medium(s) or any history tour of the building.